Thanks Otto, I just put the MCell, airport express and cable modem up atop the cabinet.... Lets see how it works out. My Setup is a docsis 3 ipv6 comcast (ubee - formerly arris) modem, A 2013 Apple airport express handling the prioirity mode of the microcell. Separately, I have another cable modem (wired, not wireless) powering an eMac (we love that old computer). ), Direct TV wireless gaming reciever, Wireless printer. Macbook Pro, and another emac occasionaly used. I have the airport express set up with a "guest" channel and my regular channel, both are password protected. I tested my speeds with the MC and airport express hooked up and it is 55 down and 11 up, Fast! Not sure how to port forward the set up, hopefully I will not have to go down that road. Hmmm, sounds a bit complicated with all of your connected devices. A priority connection, modem - > MicroCell -> router, is connecting the MicroCell directly to the "modem", by-passing the router. If that connection works without any issues, that indicates that whatever issues you may be experiencing is probably due to a router configuration. It is used mostly as a troubleshooting connection but some people find that it is the only way to get a reliable connection, and there's nothing wrong with connecting that way. If you connect the way I do, modem -> router -> MicroCell ,then you need to make sure that only one device is handling the NAT duties. I would try a simple connection (like mine) and see how that works and then add devices. Limiting the number of physical connections between the MicroCell and the router is always best. My router is an Apple Express Base Station, but we only have two wired devices connected, one of which is the MicroCell. All other connections are wireless. Some folks have even had success using Powerline adapters to make connections to the router if there isn't a convenient way to connect the MicroCell (window too far away for example). Speeds aren't your issue (anything 3Mb+ down are fine). Did you try a hard reset? I forget. So here we are, record time! Almost 24 hours without the M-cell dropping out. Really happy about this! Hopefully it stays in check! I think that since it is higher, it is helpful. Interesting. So maybe the MicroCell is like a WiFi router, the higher up it is, the better the coverage. 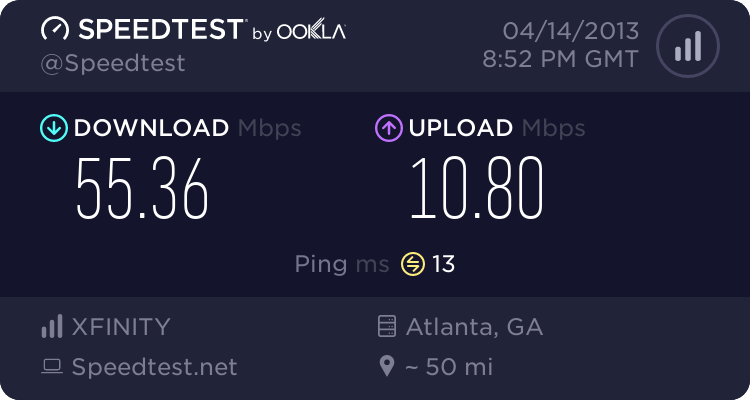 I moved my router so it is higher up than what it used to be (I think I mentioned that) and my speeds are 13.95Mbps down and 0.95 Mbps up on a DSL line with WiFi on. That's consistent with what I'm supposed to get and what I was getting before I moved the router. The signal quality is much better though and that's what I was trying to improve and why I moved the router in the first place.Turning WiFi off (on my iPhone 5) I get 2.17Mbps down and 0.13Mbps up using the MicroCell connection only. The MicroCell hasn't been moved so the speeds with WiFi off are consistent with what I obtained a few months ago when I posted my MicroCell and iPhone 5 Speed Tests. That's the reason I recommend leaving WiFi on. The MicroCell will be used for calls only and those speeds are just fine for voice. Data will be used via the WiFi connection. Try SpeedTest (which is what I use as well) with WiFi off and see what you get with your MicroCell elevated. We've had problems with the microcell for quite some time. Every one or two days our phones would lose the microcell connection and we would need to reboot the microcell to get service. I've tried just about all the troubleshooting steps and configurations with no change. That is until a few days ago. Update: we're back to the microcell dropping. Sigh. How do you have the MicroCell set up? Located 2 feet from window, no problems with microcell getting GPS signals. The microcell does not seem to have any problem getting a GPS signal, connecting to AT&T, and maintaining that connection. On power cycling the microcell, the cellphones will stay connected for anywhere between 30 minutes and a day or so -- most often the connection lasts a few hours or less. Once the connection between the cellphones and the microcell drops, turning the phone off and back on or switching airplane mode on and off does not reestablish a connection. When the connection between microcell and cellphones drops, all cellphones lose the connection at the same time. Without the microcell, the cellphones get 0-2 bars of signal throughout the house (usually 1 bar, and 1 bar when right next to where the microcell is located). The cellphones will drop and not reacquire the microcell signal even when a few feet away from the microcell. We have deallocated and reallocated the microcell, which brought no improvement. Hmmm, speed doesn't seem to be an issue so we can rule that out. Have your tried a priority setup, Modem -> MicroCell -> router? In fact, I'd just try modem -> MicroCell and leave the router out altogether. If that connection is stable, then I'd suspect something in the router config. The Motorola Surfboard should be doing nothing but passing data back and forth so make sure there isn't any NAT duties being handled by the Moto and the router. If the priority connection doesn't work and you get the same loss of connectivity, it may be a fault MicroCell. If you haven't done so already, try a hard reset (hold in the reset button for at least 30 seconds). I would imagine you've read through this thread and have seen that your problem is practically identical to my experience. I tried all the suggestions and while you should go through and try them to see if any might resolve your problem, I think eventually you should contact ATT Customer Care and start working with them to exchange your Mcell. One doesn't have to spend much time in the 3G MicroCell forums to see that this Cisco product is problematic. Hopefully your Mcell is still under warranty but you'll have to convince ATT Customer Care that you've tried all the troubleshooting recommedations before they will authorize a replacement. I'll bet that your Mcell is bad. I'm no expert but with regards to the increased battery drain issue of cell phones and Mcell usage, I'm wondering about this fact. It is my understanding that current cell phone technology incorporates variable transmitting power to extend cell phone battery life. Why transmit at maximum power if you are in close proximity to a cell tower? Makes sense to me. In order for this to work properly, there must be an exchange of signal strength data between the cell tower and the cell phone to make the cell phone increase its power up to its maximum in order to maintain a connection and/or call quality. Of course if your cell phone is moving (like in a car), there is also logic to hand your cell phone off to the next tower if the network senses your moving cell phone is migrating into the next cell tower's coverage area. As problematic as these Mcells seem to be, I wonder if they have the ability to cause a cell phone to vary its transmitting power like a cell tower can? Could a faulty Mcell be telling a connected cell phone that it needs to boost its transmitting power when in reality there is no need for the cell phone to do so because of its close proximity the the Mcell? This could certainly cause an increase in battery drain that some people are seeing. I've thought along the same lines as you have about the battery drain. I don't see it on my iPhone but that could be the exception and not the rule. At home, and not when in use, there should be/could be some polling going on from the MicroCell to the phone and back. Sort of a "hello, are you still there?" kind of a thing. That, I would think would be a low power signal and shouldn't cause the phone to use too much energy to respond back. But, if the MicroCell is sending a stronger signal, and often, and expecting a strong response from the the phone, that would cause an increase in battery usage. It's almost as if there are two basic issues. A faulty MicroCell polling way too often causing the phone to respond more often, and a phone who responds with a stronger than necessary signal, whether it's "told" to or it does it on its own. We're coming up on three years since we've had the MicroCell and have gone thru quite a few iterations of phones (iPhones, Samsungs, Blackberry) and never experienced a battery drain issue to the degree that some have reported. My iPhone doesn't hold a charge as long as I would like it too but that doesn't seem to be MicroCell related. We recently came back from a week long trip and the battery live seemed to be the same away from our MicroCell as it would be at home. But that's not say there aren't serious issues with the MicroCell. I don't think Cisco thought the design thru well enough to account for newer phones and connection options (4G/LTE). Phones are much more sophisticated than they were 5 years ago when the MicroCell was finishing development and ready for release and, because it is a totally closed system, upgrading/updating them, other than a firware update, is virtually impossible. The MicroCell was outdated probably a year after it was released, and is falling further behind every day. I shudder to think what will happen when my MicroCell eventually fails, and it will. All electronics have finite life spans, especially ones that are left on 24/7. I really wish I had an answer/fix for those of you who are experiencing this issue. I've been trying to get more information out of AT&T about the MicroCell but it is very difficult to get anyone to talk to me. Even as an AT&T ACE. But I'll keep trying. My setup is about as basic as it gets: iPhone always has WiFi on and LTE enabled. I turn off all push notifications except for one or two, and don't leave any applications open and running except for the ones I can't turn off. My account has Handing Off enabled and the MicroCell itself is on a desk with nothing around it so it gets plenty of ventilation. It's behind the router and I have port forwarding setup to a static IP based on the MicroCell's MAC address. I agree with your comments Otto. No doubt the Mcell is at the end of its useful life. Troubleshooting these things would be easier if there was more information available about the technical aspects of how an Mcell works. People who call in to ATT with Mcell problems get hooked up with a tech support person who literally has no idea how they work. The first time I called about my problem, I got a very nice person who did their best to help me but when you hear them say "Just a minute while I check something" and you hear them reading the text from the Mcell User Guide to themselves and then asking you if the power light is on, you know that they have absolutely no training about Mcells. The people who have the real technical knowledge about Mcells within ATT are completely isolated from the users and you can't cut out the middlemen to get to the person who you can truly have a meaningful exchange of information with to troubleshoot a problem. There is very little on the web about the technical side of these femtocells as it seems manufacturers like Cisco don't want much out information out there. So people resort to forums like this to try to find answers when they become frustrated with their femtocells and can't get help from the supplier. These forums are certainly helpful in that we can readily exchange ideas and possible solutions a lot faster than dealing with ATT. All that being said, the Mcell (when it is working) provides a useful solution to people like myself who because of their location, can't get a decent cell tower signal in their homes and suffer from dropped calls. It's better than nothing and fortunately for me, that's what I paid for my Mcell. @Avedis53 - well said. I will make sure that your comment, in its entirety, gets to my contacts in Support. Can't hurt. While off-topic, I found this to be very interesting. Ubiquisys is a privately owned company in England that specializes in small cell technology, including femtocells. In fact, Ubiquisys residential femtocells have been selected by more mobile operators than any other. Looking at their website, their line of products and the technology they use appear to be superior to what Cisco is currently offering by way of their AT&T Microcell product. Cisco announced on April 3rd their intent to acquire Ubiquisys by the close of the fourth quarter of 2013. It would appear to me that rather than reinvent the wheel, Cisco is buying the technology they will need to be a leader in femtocell products. Assuming that AT&T continues to retain Cisco as their supplier of femtocells, hopefully we as consumers will see new and better femtocell products provided to those of us who use them.